No handling charges on cheese and sausage gift baskets and gift boxes - pay shipping only. Call for special shipping rates on custom gift boxes and volume orders for businesses. Multiple orders can also be emailed or faxed. Select from various Bavaria Gift Cards for in-store use or Electronic Gift Certificates for online use only. All of our grilling sausages are very lean and juicy. Most are pre-cooked and ready for the grill and will not shrink. Our brats are 10-12% fat. Several Varieties to choose from. 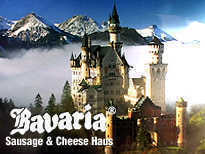 Our most popular are the Bavaria Beer brats, Nurnberger and Munich Weisswurst. Here are the best most Authentic Landjager you will find! 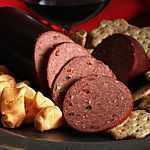 A special all beef dried sausage to take camping, hunting, biking, etc! A great healthy snack.- Also good stuck in a Bloody Mary! Super lean All Beef Summer Sausages for all your party needs. Many flavors to choose from! Here are all those special unique European Hams. These are best sliced paper thin. Many are dry cured heavy smoked, and aged. Some are cured and cooked. These hams all all very unique and all very different. Knackwurst, Pork Schnitzel, Pork Hocks, Sauerbraten, Veal Schnitzel & More! Special German Hard Rolls, and Pretzels direct from Bavaria. Rye Breads, Cakes, Cookies, Wafers, Crispbreads, Crackers, and Baking Supplies! We have it all! A real nice selection of the most gourmet German sandwich meats you could ask for. A few very unique hard to find meats like blood sausage and Headcheese. All the best and most popular European candy and chocolates, liquor chocolates in all the best brands- this section is a must! 5 delicous varieties of good PURE liverwurst, and 4 types of mettwurst. Our creamy Braunschweiger is a popular favorite! All the best salamis you will find right here! Nice and lean and some made with Rum! We have a great selection! Fleischkase/Leberkase, Rouladen, Sauerbraten, Kassler Ripchen, Veal or Pork Schnitzel to prepare in your own kitchen! New products that have just come in, or are back after being gone for a long time. Yes, we have Curry Ketchups, loads of Mustards, sauces and many more items to serve with your traditional German Meals! Don't want to make a large batch of potato sald? We will do it for you! We also have that requested German Wurst Salat! Check it out! All the Knodel, Dumplings, Kartoffel, Potatoes, Egg Noodles and Spaetzle/Spatzle your taste buds could ever desire are right here. These are a must have when serving your special German meal! No Good German Meal can be complete without a delicious dish of Red Cabbage or Wein Kraut! Looking for that good European herring?? We have it! A very large selection of herring in salt, pickled, creamed and in many different sauces! Here is a very nice selection of German and Polish pickles also a nice variety of pickled vegtables. These will be a excellent addition to your BROTZEIT! We have all your unique fruit spreads from Europe. A must have to put on your breakfast "brot" or Brotchen! 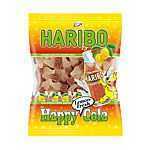 Haribo, Katjes & Softies from Bavaria Sausage Inc.
Tschibo, Eduscho, Jacobs, Movenpick, Dallmayer, and all of your favorite German Coffee, as well as a large selection of your favorite Saft & Juices. German Hats, Aprons, Beer Boots, Health & Miscellaneous. Unique requested items that you might be looking for! A nice variety of specialty items made in Wisconsin. For that person who is still a "Cheese Head" but does not live here anymore!! Authentic old world German Family Recipes.